Top Rail Lock: The Everlock 2-piece top rail system is designed for positive performance in severe weather conditions, and traps over-sized panel tabs in a deep locking channel. 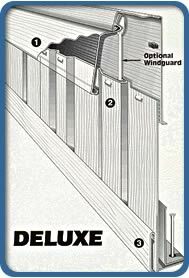 Panel Lock: Designed to individually lock each panel together for extra strength and secure fit. Your best guard against blow-out. 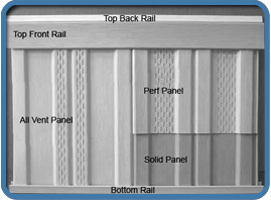 Bottom Rail Lock: Designed to firmly anchor super-sized panel tabs in the grooved bottom rail channel. Bottom rail lock does the job when the weather is against you. Scratch & Scrape Resistant: Impregnated vinyl color is scratch and scrape resistant, and provides a lifetime of uniform appearance. Quick, Easy Storage Space: Everlock Deluxe provides quick access for storage space at any point around the base of your home. Dent, Kink & Bump Resistant: Children at play have no effect on this tough durable skirting system. Safe: Everlock Deluxe is flame retardant and does not conduct electricity. Easy Care: Virtually indestructible and maintenance free. No worry about rust or corrosion of any type. Easily cleaned with soap and water. Available Colors Colors shown may vary from actual product. Fast and simple solution towards accessing your home's crawl space using minimal parts and labor. Check local zoning code requirements for proper ventilation.